I’ve multiple times stated my hatred for heat styling and exactly why I don’t let it near my hair. But since I still occasionally want to change my hair up a bit, what do I use? Well if you want to achieve the effect of a really twisted and unflattering pose when you attempt to show off your hair, I recommend foam rollers. Foam rollers can be bought almost anywhere, I even think I bought mine at the pharmacy. They’re long foam like sticks that come in various sizes. They can be used for various kinds of curls and waves, this time I opted for just a slight wave to bring some life into my hair. As you can see in the photo, I only used a few of them on each side. You can also tell I was extremely tired when I did this, I don’t know what it is with me and unflattering photos. If you want curls rather than waves, take smaller sections of hair for each foam roller. You want your hair to be dry and have a bit of wear to it. Either shower on the morning of the day you intend to do this, or the night before. Brush your hair out and part it where you want it to be parted the next day. Some people use setting schemes or patterns, for a casual look like this I didn’t follow a specific pattern but rather worked until all of my hair had been rolled up. If you’re opting for curls rather than waves, spray each section as you roll it. If you want waves, spray your head when you’re done rolling. Some people use a setting spray or lotion, I use a spray that’s meant to be used for blowdrying. It was cheaper and the hairdresser I spoke to recommended it to me. I like it because it’s not too heavy or makes your hair feel like something dried in it. It doesn’t feel nasty is what I’m trying to say. You want to roll downwards. When you hold out the roller, you want to pull your hair over and around the roller instead of under and around. 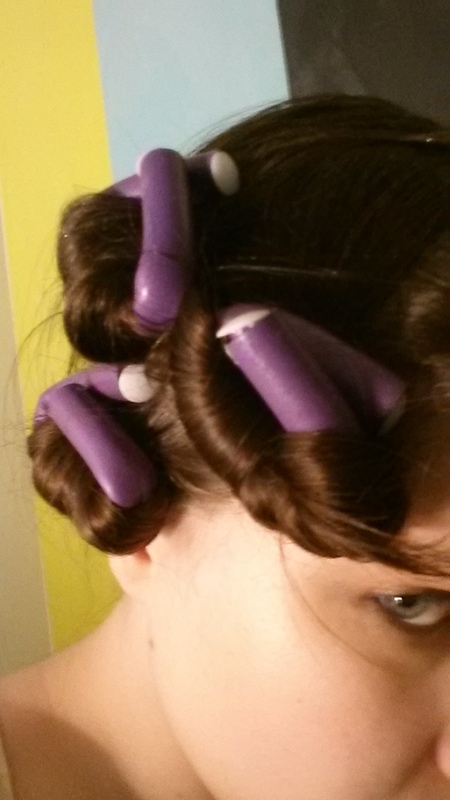 Then roll inwards until your hair says stop, bend the rollers upward to keep them in place. Then you go to bed. Wake up, that’s usually a good start. This time I woke up at about 6, so they had been in my hair for about 7 hours. Remove them carefully. Roll them down slightly, then when there’s space, pull the curler out so that your hair rests in a little ball in your hand. Let it down carefully, twist it in and away from your face. Since it was a Saturday, I went back to bed and stayed in until nine. If I’d opted for curls I never would have gone back to bed with them unleashed so to speak. When you’re ready to actually start your day, brush them out carefully. Very carefully. I’d recommend using a wide toothed comb or a paddle brush with hard and far apart bristles. When everything is styled the way you want it, you can secure it with hair spray. If you want some inspiration for simple things to do with it, take a look at my post about quick and easy hair styles. 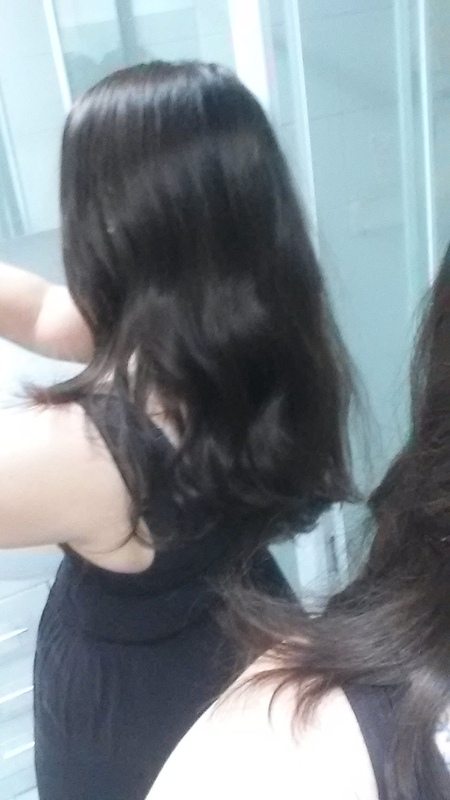 If I’m only doing this loose wavy thing, it takes me 5 minutes at night and 5 in the morning. If I’m doing a more careful setting and actual curls, it can take 10-15 minutes for each round so to speak. It can be as quick and easy or as advanced as you like it. That’s one of the reasons I like foam rollers, they’re surprisingly versatile. They’re also far more gentle on your hair than a curling iron or those velcro rollers. I recon 10-30 minutes is the same amount of time in total that you’d have to spend if you used heat styling, so it doesn’t take any longer in terms of active styling than more popular methods. For me it’s a good option because I’m more awake at night and want to be able to get ready quickly in the morning (I’m barely functioning until I’ve had coffee, so I try to be out of the house within 20 minutes of getting up). Any downsides? The fewer rollers you use, the less comfortable it is to sleep on them. I saved this photo for last, you can probably see the hair the best here, but for some reason the rest of me got caught in the single most unflattering pose I’ve ever seen. Shadows that make it look like your arms have cellulite are downright evil. Why do I recommend this? It’s one of the most gentle styling options for curling your hair, it splits the time up so that you don’t have to do everything in the morning, you can create fantastic Veronica Lake inspired styles with this method, it feels more genuine vintage (at least to me) than using a curling iron and teasing. Oh, and it’s cheap. The rollers last a long time and you only need to use a fairly small amount of product, I’ve had that one spray for 1-1.5 years. I use this on days when I want to do something a bit different, like today. Or when I have an event I actually want to be dolled up for.